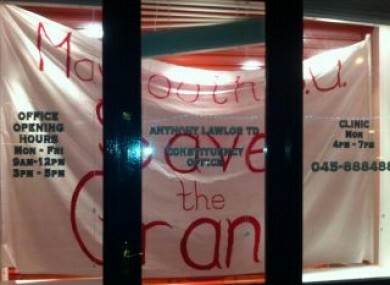 Maynooth SU's 'Save the Grant' sign in the TD's office. THE FINE GAEL TD whose offices are being occupied by several Maynooth students in a protest against cuts to third-level grants and increased fees says he does not want to see the group get into trouble over their actions. The students have spent a night in the office after entering it yesterday afternoon equipped with sleeping bags and enough food to last a week. Speaking to TheJournal.ie, Deputy Anthony Lawlor said that there were a few gardaí at the scene of the occupation, but that he wasn’t calling on them to evict the protesters. “Listen, they’re students – the last thing I want is to get them in any sort of trouble because something like this could affect their career,” he said. Lawlor said he was taken aback by the protest occupation because he had met with students at Maynooth recently to discuss their concerns. Asked if he was considering the students’ demands on preventing fee increases and grant cuts, the TD said that he would not be negotiating with the group currently occupying his office because “there’s a time and a place” for holding talks, and this isn’t it. The students told TheJournal.ie yesterday that they want Lawlor to commit to the Fine Gael party’s manifesto on education, which the students say outlines a pledge not to hike fees. The Maynooth Students’ Union president Rob Munnelly said they felt compelled to undertake the occupation after their previous efforts to lobby TDs failed. He said the group would continue its occupation until the campaign succeeds or “the gardaí drag us out by force”. The only concern I had yesterday was when they rushed into the office and my staff members got a bit of a shock initially as [the students] didn’t identify themselves until they were all in there. That makes me concerned for the future too, that I’d have to put security cameras in there, which I don’t want to do, but the last thing I want either is for the staff to feel upset or threatened. Lawlor also said he spoke briefly to the group last night when the students passed on a message to him from a constituent who was trying to get in touch with him. Email “TD 'reluctant to involve gardaí' in student occupation of his office”. Feedback on “TD 'reluctant to involve gardaí' in student occupation of his office”.